Where Inspiration Takes Flight is a community art project on display as part of the "I Am Ali" Festival this summer in Louisville, Ky. Throughout the festival, visitors are encouraged to answer the question "What Inspires You?" by writing it down on a butterfly window cling. 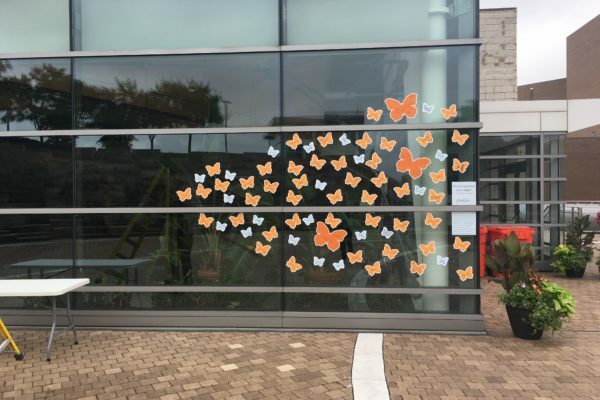 The butterflies are displayed on the Ali Center's outside lobby windows for visitors to enjoy at any time during the day. Look for your opportunity to fill out a butterfly at numerous "I Am Ali" Festival events June 3-July 15th! The 3200 sq ft Main Lobby is located on the second floor of the Muhammad Ali Center. This modern and open space is highlighted by a ceiling view of the base of the copper torch inspired by Muhammad Ali’s participation in the 1996 Olympics, a key architectural element of the Center. The Main Lobby is also home to one of the highest escalators in the state, which leads visitors to Level 5 where the exhibit experience begins.